More information about setting your bandwidth throttle, including how to test your bandwidth capacity, can be found in the Optimizing Tixati Guide. This view contains an upper and lower frame. 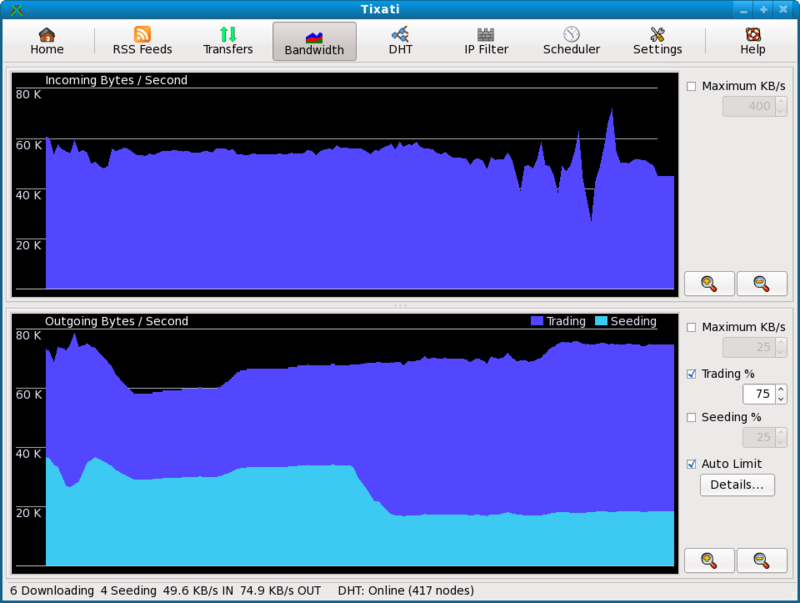 The upper frame shows incoming bandwidth, and the lower frame shows outgoing bandwidth. The position of the divider between the two frames is adjustable by dragging it with the left mouse button. The 'Maximum' check boxes and numerical controls allow the user to set a maximum speed that will be allowed, in kilobytes per second. The maximum outgoing bandwidth (bottom frame) should be set to about 70% of total outgoing capacity. Total capacity can be determined by activating many transfers and turning off the throttle and observing how high the outgoing bandwidth typically goes. The lower outgoing bandwidth frame has Trading/Seeding bandwidth proportion controls. This allows better control over the proportion of outgoing bandwidth that will be prioritized for trading purposes (i.e. for peers that may reciprocate any data chunks sent to them) and bandwidth that is used purely for seeding or given to other downloading peers when a transfer has stalled due to lack of useful pieces in the swarm. The Auto Limit feature was new for version 1.37. It works by measuring latency and adjusting the bandwidth throttle accordingly. More information about this feature can be found on the Automatic Bandwidth Limiter help page. Zoom-in and zoom-out buttons are provided in order to set the time-scale of both charts. The zoom level on the two charts are locked together, so the buttons in both the bottom and top frame have the same effect.